Even heavy cups with ice! 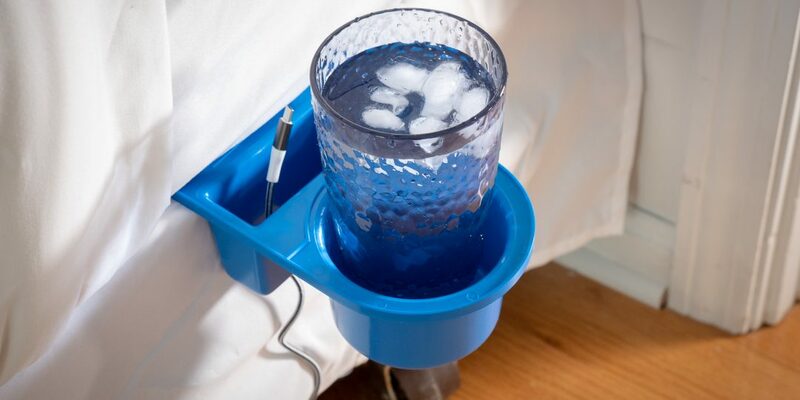 Tuck-In Nightstand will work in most situations. The overall performance depends on the furniture it is used with. Please take a moment to check your current arrangement to see if Tuck-In Nightstand is right for you. Save space by ditching your cumbersome end table and be more organized. When it is time to move, Tuck-In Nightstand goes with you. Dishwasher safe so you can keep it clean easily. Tuck-In Nightstand is made of a durable, recyclable plastic that is compact and lightweight. It is sturdy and able to handle almost any size glass/bottle and all modern sized cellphones including case.